Multicellular organisms form their bodies anew each generation from a single cell. This amazing process is studied at the University of Maryland, College Park by over 20 faculty housed in several departments. 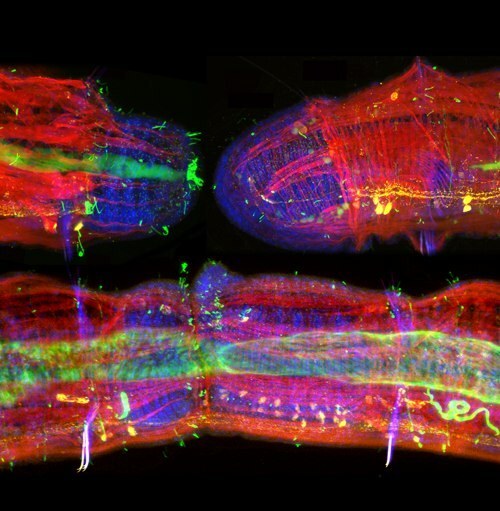 Their work collectively addresses fundamental questions in developmental biology, such as how genes and their products regulate formation of anatomical features, post-embryonic development and regeneration, the role of experience in shaping the nervous system, and how novel adaptations evolve through the modification of development. Pristina leidyi regeneration (top) & fission (bottom). Image courtesy of Dr. Alexa Bely. Devo Club: An interdepartmental joint group meeting for UMD labs that study animal development and its evolution. Schedule for current academic year. FaCTs (not facts): Faculty Chalk Talks in Genetics, Cell and Developmental Biology. Meets twice each month. Sign up to talk here.